Discover why personalized hand fans branded with your logo are a natural branding opportunity at church, outdoor company events, and even at weddings. Are you feeling the heat to conjure up intuitive gift ideas to give away at your next event? It isn’t always easy to know what items people will find useful and interesting. This is especially true of events that tend to bring together people from all different backgrounds, ages, and demographics. Events such as weddings, church outings or social events, and business functions all face this same challenge. While each event has certain unique needs, one thing that most all of these events have in common are people. Lots and lots of people. Usually, this involves large numbers of people at an hours long event. Many times, such events are hosted in a confined space, or venue that is vulnerable to warm weather. The longer the event, the greater risk of rising temperatures, as well as increased frustration. This is where one of our classic promotional items takes the stage: custom hand fans. Although they vary in shape, size, and functionality, handheld fans can help your clients, colleagues or guests beat the heat. Ranging in cost from under $1 to just over $10, we provide you with options for any budget. Our custom hand fans are available in a variety of styles, from simple hand fans to battery operated misting fans. With handy fans to combat heat, people can better enjoy their time. Attendees would rather focus on more pleasant topics than the unbearable atmospheric conditions. In addition to dealing with adverse temperature conditions, our hand fans can convey your message. Data from a 2019 Ad Impressions Study from the Advertising Specialty Institute (ASI) suggests that promotional fans have the potential to outlive the initial event. While hand fan use wasn’t specifically tracked, an average desktop accessory or umbrella was kept longer than 12 months. During this time, desktop accessories make an average of 1,450 impressions, with umbrellas seeing around 1,100 impressions. The handheld fans we offer come in a variety of styles and price ranges. No matter what your budget is, we have you covered. From the most basic and manually operated hand fans, to the modern, battery-operated devices, we will walk you through your choices. Others, like our 8” Papersplash or Paw Print, are made from thick, card stock material attached to a wooden handle. We even have a Coloring Paper Fan Set that is perfect for kids. This creative hand fan is made of a paper fan with a plastic handle. It comes with blue, green, yellow, and red colored pens, making them both useful and entertaining. Another popular trend is custom folding fans, like our Breeze Foldable Hand Fan, Flip-Out Flyer Fan, or Twist N Chill Fan. Each is made of flexible nylon material that can fold to almost one fourth of its original size. These fancy fans are available in eight different color options. Equipped with portable pouches or carrying straps, they store easily in a pocket, purse, glove box, or wherever! Designs, messages, and logos are permanently applied by a precision printing press, resulting in a professional appearance. With a little bit more in your budget, you can venture past the typical handheld fan to an electric fan. Designed with ease and portability in mind, these devices can tuck away easily into a bag, drawer, or pants pocket. Since they run on standard sized batteries, there is no need for repetitive, manual fanning motions. Simply install batteries and flip the switch to on. Check out a variety of mini fan options like mini fans with caps, lanyard fans, and foldable electric fans. For those with the budget to back them up, we have the ultimate in personalized hand fans: misting fans. Anyone who has had the pleasure of using a misting fan knows that there is nothing like it. While a cool breeze can feel amazing on its own, that extra blast of chilled water droplets is enough to make you melt. Smaller misting fans, such as the Fiji Water Pocket Fan, are available for prices comparable to midrange hand fans. For slightly more, you can upgrade to a larger and more ergonomically designed option like the O2COOLA Carabiner Misting Fan. For most occasions, these are more than adequate for hours of feeling cool, calm, and collected. If you want to go for the best, however, look no further than the O2COOL Large Deluxe Misting Fan. Constructed from sturdy, transparent ABS plastic, this oversized misting fan can hold more than 1,000 mists without being refilled! The sides of the powerful, battery-driven fan blades are protected inside the surrounding housing. Along with protecting the fan from unintentional damage, it helps keep users and those nearby from inadvertently touching the blades. The O2COOL Deluxe is available in both blue and red, with a 1 1/8” x ¾” area for your custom design. No matter which fan you choose, your event will be better for it. The statistics outlined in the ASI study present a solid case that hand fans have a great CPI (cost-per-impression) value. For example, a $1 fan that is viewed 1,000 times has a calculated CPI of 1/10 of a penny. This is not unreasonable to assume, given the known facts about both desktop accessories and umbrellas. 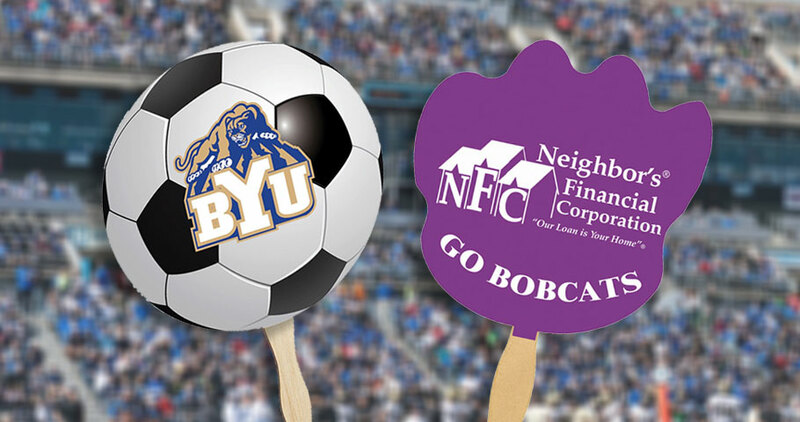 For a business that is trying to promote on a budget, branded hand fans are ideal for crowded and overheated venues. Alternatively, if your event is located in a warm climate, fans are a useful item outdoors too. Not only will a promotional hand fan assist in keeping people comfortable, it will connect your brand to the refreshing feeling of a cool breeze. Speak with one of our experienced sales representatives to pick the right custom hand fan for your next event. That way as temperatures rise, your brand will become the hot new center of attention. As clients cool down and relax, they have the opportunity to hear about what else your company has to offer. When purchased in bulk, as for large weddings or parties, our personalized fans start at under $1 each. This makes it a cost effective way to creatively cool off on the dance floor. Then, when the sun rises, your guests will have a useful wedding favor by which to remember a good time. Maybe you feel like spoiling your dedicated wedding party with one of our higher quality hand fans. Consider one of our misting hand fans, ranging in price from under $2 to just above $10. Cool gifts for your cool crew, at an even cooler price! The Time to Chill Out is…Anytime! While it’s nice to dream of a future in which we can control the weather, that day has not yet come. In the meantime, we must do what we can to beat the heat. At the beach, in the park, or at a crowded venue, handheld fans can get the job done. Regardless of budget, our expert sales specialists are standing by to help. Don’t let hot and humid weather get the best of you or your guests at the next big event.